[p.33]The early history of crime in Utah is difficult to follow. Often the line between religious transgression and crime was blurred. Both sin and crime were tried in ecclesiastical courts convened by Mormon bishops or other religious leaders. The appointment of territorial judges did not simplify matters. The continual dispute between “outsider” judges and local leaders led to chaos and manipulation of the judiciary. Judges accused Mormons of trampling on the Constitution and destroying the separation of church and state. Mormons called judges “carpetbaggers” and accused them of using their positions to persecute people because of their religious beliefs. There have been more murders committed and more blood shed in the county, within the last eight months, than before or since its organization. We clip the above from the Church Organ of the 20th inst. and it is a piece of the whole which abound in self-laudation, and hypocritically assumes what a good people we are. After assuming that innumerable murders have been committed within a specified time, the very period when the “Gentiles” have been more numerous than heretofore, the Editor, although he does not say it, seeks to leave the impression that they are the offending parties. It is a species of deceit and chicanery peculiar to Mormonism, and so long practiced that we are led to believe that they esteem falsehood a virtue when it can be made to suit their own purposes. According to available records, few executions took place between 1847 and 1878. One of the first documented cases involving a form of Utah justice is that of Jean Baptiste. Baptiste was a grave digger at the Salt Lake City cemetery. In 1862 he was arrested for grave robbing. There are two accounts about how his crime was discovered. In one a mother shopping in a used clothing store discovered the handmade, one-of-a-kind dress she had used as a burial gown for her young daughter. The mother promptly brought this to the attention of the authorities. The other account is in Dale Morgan’s The Great Salt Lake. He reports that George Clawson, the brother of ‘Rone [Moroni] Clawson, decided to rebury his brother in the family plot. Upon opening the exhumed coffin, he found his brother was wearing no clothes. Further investigation showed ‘Rone had [p.35]been buried in clothes purchased at the personal expense of one of the city police officers. The trail led to Baptiste who was arrested while digging graves at the cemetery.1 It was subsequently discovered that Baptiste (also called “John the Baptist”) had been robbing graves for many years and that his small home was stacked with cartons containing clothing of the dead—especially that of women and children. With punishment like this, the death penalty was probably not necessary. There were, of course, other forms of punishment available official and unofficial—as means of social control. These included public confessions, excommunication, and ostracism. Most of these were intended to follow the early colonial philosophy of humiliation and ridicule. Still there were nine executions between 1847 and 1878. The first two officially executed men were native Americans. Allen Weeks, a farmer living in Cedar Valley in present-day Utah County, sent his two sons, William F. and Warren D., up the canyon with an ox team for a load of poles. On 8 August 1854 a small band of about ten or twelve Ute Indians, who had separated from their tribe, camped near Cedar Valley. They swore among themselves that they would not make peace with whites until they had revenged certain wrongs of the previous year. The witnesses listed for this hearing were Allen Weeks, Natsab, Yantan, and White Weasel. Another name, possibly Inon F. Itch, is illegible. Five years later, when working as a shoemaker for Alexander Carpenter, Thomas N. (or A. or H.) Ferguson asked for past wages and was refused. According to Ferguson, he went to a nearby saloon and had a “couple” of drinks. The next thing he remembered was sitting in jail charged with the murder of Carpenter, who had been shot on 17 September 1859. Ferguson had been in Utah just over a year at the time of his execution. Little is known about him other than the personal references he made in his final comments while standing on the gallows. He was twenty-seven years old and had no past history of crime. His trial was over quickly. He appeared before Judge Charles E. Sinclair, who left the territory and returned East shortly after Ferguson’s trial. Bill Hickman was appointed Ferguson’s attorney. Found guilty, Ferguson was sentenced to be hanged on a Sunday, but Ferguson appealed to newly appointed territorial governor Alfred Cummings and the execution was rescheduled for Friday, October 28. [p.38]Well, I was tried by the statutes of Utah Territory, which gives a man the privilege of being shot, beheaded or hanged; but was it given to me? No, it was not. 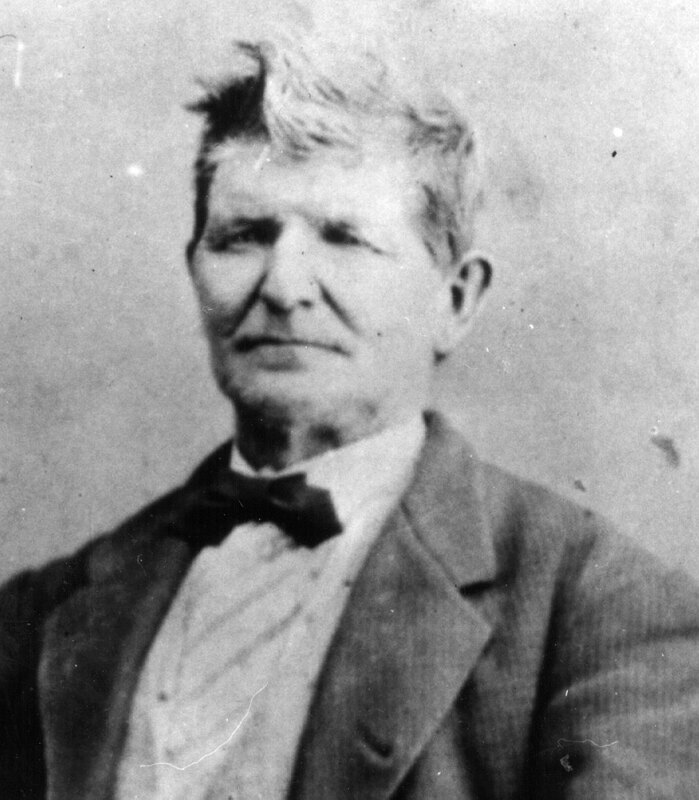 All Judge Sinclair wanted was to sentence some one to be hanged, then he was willing to leave the Territory; and he had too much whiskey in his head to know the day he sentenced me to be executed on, and would not have known, if it had not been for the people of Utah laughing at him; it would have been Sunday. A nice Judge to send to any country. On 31 July 1861, Robert Brown, a watchmaker, died of a gunshot wound to the chest. Witnesses said William Cockroft shot at Brown with a double barrelled shotgun as Brown passed his house. After missing with the first round, Cockroft rested the gun on the gate and as Brown raised his hand and said, “Don’t shoot,” Cockroft fired again. Brown died forty-five minutes later. Luce said he had met Bunton in Bannock, Montana, while working at the mines. He was invited by Bunton to his home for supper. While there Bunton asked Luce if he was a Mormon and when he replied he was, Bunton jumped him, beating and stabbing him. On another occasion, Luce reported encountering Bunton, who drew a knife and threatened him. On 7 December Luce saw Bunton in downtown Salt Lake. He approached him, asked if he was Samuel R. Bunton, and when the man replied, “Yes,” Luce said, “Well, we have an account to settle, and may as well settle it right here.” Luce claimed Bunton then went for his weapon and Luce stabbed and killed him with his bowie knife. There is more to the story than this, however. Jason Luce was a brother-in-law of Bill Hickman and a member of his gang. There were suspicions that this group did the bidding of those in positions of authority (ecclesiastical and secular) but also often ventured forth on their own. Sometime during 1859, Luce killed Joe Rhodes by running him through with a bowie knife. He was tried and acquitted. In [p.41]the spring of 1862 he was arrested as a member of a group who beat Governor Dawson at Ephraim Hanks’s way station as he was leaving the territory.10 Luce and others involved in the beating claimed they were ordered to do so by law enforcement officials in the city. With Hickman as his attorney, Luce was found guilty and sentenced to die by firing squad for Bunton’s death. The sentence was carried out on 12 January 1864 at 12:00 p.m., exactly thirty-six days after the crime occurred. On 2 October 1866 at Faust’s overland station in Tooele County, Frederick White, a discharged soldier belonging to Company F of the Nevada Cavalry, fought with Robert Sutton, a hostler at the station. Sutton got the better of the argument, but he was angry at the offensive name White called him. That night he found White and shot him as he [p.42]was sleeping in the wagon box. Sutton was tried and sentenced to death. Sutton’s last words were, “To hell with your little Jesus.” He then asked for a drink of whiskey. At the command to fire one report noted, “All but one of the people in Tooele heard the echoing reports of the shots that rang through the valley. The only one who failed to hear the crack of the rifles was Sutton who slumped lifeless against the bonds.”14 Sutton’s execution took place exactly eight days after his crime. On 11 December 1868 eighteen-year-old Chauncey W. [p.43]Millard was traveling along the west side of Utah Lake in the company of Harlem P. Swett and Chauncey Mayfield—both freighters. Swett and Mayfield were riding in the front seat and Millard was in the back of the wagon. Suddenly Millard fired from the back, killing Swett. He next shot Mayfield through the hand as Mayfield put up his hand to protect himself. Mayfield then jumped from the wagon and ran towards Lehi for help. Millard ran the other direction—making his escape toward Cedar Valley. For five days he holed up in a cabin, then robbed the owner, and disappeared again. He was captured 17 December by Orrin Porter Rockwell and Deputy Sheriff Henry Heath. Millard was sentenced to be executed by firing squad. On 29 January, fifty days after his crime, he was led in irons to the west side of the Utah County court house in Provo. According to the Deseret News, 3 February 1869, four hundred persons were present. Prior to his execution he stood and read from the seventh chapter of Matthew, spoke briefly with officials, including the attending physician, and then sat down. The signal was given to fire and Millard was dead. In 1857 a wagon train of men, women, and children from Missouri and Arkansas was traveling through Utah on its way to California. After the expulsion of Mormons from Missouri and the killing of Parley P. Pratt, a Mormon apostle, in Arkansas by the estranged husband of one of Pratt’s plural wives, there had been considerable animosity among many Mormons to anyone from that part of the country. Apparently there were other difficulties with this wagon train as it moved through Utah. While camped at Mountain Meadows, Utah, the wagon train was attacked and ninety to one hundred twenty people were killed—the only survivors were seventeen young children. The massacre was at first attributed to Indians, but it was later discovered that as many as fifty Mormons were also involved. The only person ever prosecuted was John D. Lee. Some have suggested that Lee was the scapegoat for the incident; others have maintained that Brigham Young, attempting to secure statehood for Utah, was pressured to resolve the Mountain Meadows Massacre issue as expeditiously as possible. 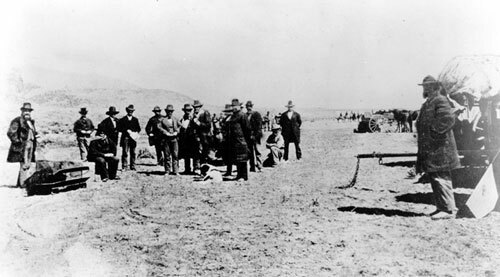 Lee had left southern Utah after the massacre and settled on the Colorado River at a crossing known as Lee’s Ferry. In 1874 while visiting in Panguitch, Utah, he was arrested. His first trial in 1875 resulted in a hung jury. The jury consisted of eight Mormons and four non-Mormons. He was tried again in 1876 by an all Mormon jury and was found guilty and sentenced to death. His comment at the time was, “I have been sacrificed in a cowardly, dastardly manner.” After spending a year in prison, he was returned to Mountain Meadows. As the firing squad was being readied, his final words were, “Center on my heart boys. Don’t mangle my body.” When he was shot, his body fell backwards into the [p.45: photo of John D. Lee] [p.46: photo of Lee by his coffin][p.47]coffin he was sitting on. He was buried in Panguitch, Utah, by his sons. LDS president David O. McKay reinstated Lee to full membership in the church in 1961. This reinstatement followed the persistent efforts of Ettie Lee, his granddaughter, and Juanita Brooks, author of Mountain Meadows Massacre.16Lee had organized group homes for delinquent boys in memory of her grandfather. On 11 June 1877 Wallace Wilkerson and William Baxter were playing cribbage for money at James Hightower’s saloon and store in Homansville, about three miles from Eureka near Tintic. An argument broke out, with each accusing the other of cheating. Wilkerson became angry, drew his pistol, and shot Baxter in the head. Then, according to witnesses, he took hold of Baxter’s head and shot him again, this time in the side of the head. Wilkerson was caught soon afterwards and taken to Goshen, where he had to be protected from lynching. Wilkerson was raised Mormon by his parents but had followed his own path. He had been born in Quincy, Illinois, and went to Utah with his parents at the age of eight. From the age of seventeen on, he worked at tending stock, breaking horses, and other such jobs throughout the western states—even enlisting as a drummer in the military in San Francisco. His record contains reenlistments as well as several desertions. He travelled back and forth between Utah, California, and Nevada, but just before Baxter’s killing he had returned to Payson, Utah, to be near his aging parents. [p.48]Just then some jig dancing was done and a fellow named Gillespie got shooting off his mouth about being the best dancer. … So I invited him to dance with me. They had just commenced, when Gillespie said, “… I’m not going to dance with you, you son of a b—h.” I told him to go slow or I’d teach him an entirely new waltz if he talked like that again. … Baxter ran in with a six-shooter in his hand, and said, “You G— d—d Mormon son of a b—h, I heard you werecoming here to make a row, and now we’ll give you plenty” (ibid.). From that time on, according to Wilkerson, there was constant conflict between the two men, culminating in the fight that ended Baxter’s life in the Homansville saloon. In all the annals of criminals we know of no cranium or physiology which gives better proof of an innate criminal than those of our subject. His whole physique bore testimony to the truth of science of phrenology. He was wanting in ideality and imagination. This want saved him from the anguish that a sensitive person would have suffered in his situation—the certain approach of a felons doom. … So his wants weresupplied, he could be merry over his coffin (Salt Lake Tribune, 17 May 1879). On May 15 he left the prison and was transported to Provo where he spent the night. His wife had come from Tintic to be with him. The next day around twelve he was [p.49]taken to the jail yard and a paper target was pinned to his heart. He had requested no blindfold and apparently was not tied to the chair: “The instant the bullets struck him, he raised on his feet, turned partially to the south, and as he was pitching forward, took two steps and fell on his left side on the ground. On the instant of striking the ground he turned on his face, exclaiming, ‘My God! My God! they’ve missed it'” (ibid.). Apparently at the command to fire, Wilkerson drew his shoulders back, and this raised the paper target pinned to his jacket. Three bullet holes were found in the target, but they were an inch above his heart. The fourth bullet hit Wilkerson’s left arm, six inches from the others (ibid.). Wilkerson lay on the ground fifteen minutes before he died, and officials briefly feared they would have to shoot him again. This spectacle prompted the Ogden editorial calling for the use of the guillotine for future executions. 1. Dale L. Morgan, The Great Salt Lake (Indianapolis: Bobbs-Merrill, 1947), 274-330. 2. See Journal of Discourses, 26 vols. (Liverpool: Latter-day Saints’ Book Depot, 1855-86), 9:191-94. 4. James B. Hill, “History of Utah State Prison, 1850-1952,” M.A. thesis, Brigham Young University, 1952, 26-27. 5. Juanita Brooks, ed., On the Mormon Frontier: The Diary of Hosea Stout, 2 vols. (Salt Lake City: University of Utah Press, Utah State Historical Society. ), 2:527. 6. Record of U. S. District Court #879, United States v. Longhair and Antelope. 8. In Deseret News Magazine, 5 Aug. 1951. 9. A. Karl Larson and Katharine Miles Larson, eds., Diary of [p.50]Charles Lowell Walker, 2 vols. (Logan: Utah State University Press, 1980), 1:191. 10. For more information on this incident, see Hickman’s autobiography, “Brigham’s Destroying Angel” (Salt Lake City: Shepard Publishing Co., 1904), 149-59; Hope A. Hilton, “Wild Bill” Hickman and the Mormon Frontier (Salt Lake City: Signature Books, 1988), 100. 12. Pearl Nelson Gillespie, “Tooele’s One and Only Execution,” paper read 2 Nov. 1970, Emma J. Atkin Camp, Daughters of Utah Pioneers. 13. History of John Gillespie (Mar. 27, 1830-Feb. 9, 1915), Utah Pioneer, Sept. 10, 1852. Compiled and Written by Himself (N.p. ; n.d.), copy in my possession. 15. Harold Schindler, Orrin Porter Rockwell: Man of God, Son of Thunder (Salt Lake City: University of Utah Press, 1966), 349. 16. Juanita Brooks, John Doyle Lee: Zealot—Pioneer Builder—Scapegoat, 2d ed. (Glendale, CA: Arthur H. Clark Co., 1962), 376.